december is here, as is the holiday cheer and a very short countdown until christmas day. are you guys ready for the festivities that lay ahead and the start of 2017? my year has been filled with a lot, and by a lot i mean i hit most of my personal goals and even got the blog to have it's own visitors. let's face it, the early days of blogging means the only readers are family members and as of lately i don't think my family members are logging onto multiple computers and viewing my blog daily. unless that is you you family members then keep doing it because it feels damn good to see the views count go up and keep logging on to multiple computers to keep it going, i approve of this craziness! Urbane Grain, this was a completely new-to-me product, and the concept and packaging seem familiar, add hot water and enjoy. 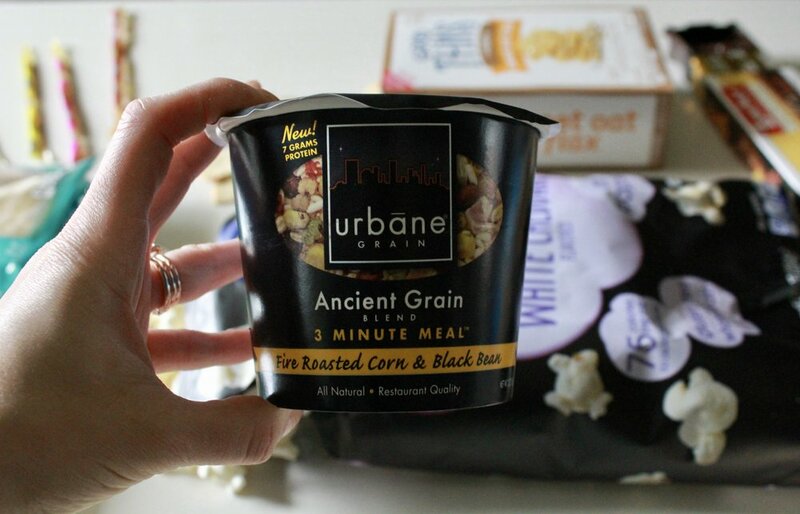 Urbane Grain, a 3 minute meal in a instant ramen style cup. the flavor fire roasted corn and black bean, made with ancient grains amaranth, sorghum and barley offer 9 grans of protein and 5 gram of fiber. now available in 7 flavors. Pillsbury purely simple cake + cupcake mix and frosting mix. now i've baked many a boxed cake in my time, and have used pillsbury brand mix and pre-made frosting but have never seen a "to-be-made" buttercream frosting mix. the concept is simple just like the cake batter, add water and butter, mix and enjoy. the purely simple line contained no coloring, preservatives, or artificial flavors. Homey Acres Honey Straws. one thing we go through like some go through peanut butter is honey, we love and use honey in my house regularly. honey acres raw honey straws are flavored and sealed in plastic and in a plastic overwrap assuring each straw in always clean, fresh and extremely portable. Wise Popcorn: if you remember, i had tried Wise Popcorn in one of my first degustabox's, the cinnabon flavor received was not to my liking, but this time around with a full sized bag of white cheddar air-popped popcorn i am digging it! Ricola Immunity Honey Herb Supplement Lozenges, now i am very familiar with ricotta, who did not grow up elongating the name pronunciation just like the tv commercials did? so the box that arrived in my monthly box is formulated with ginseng, vitamins c, b6, and b12 to help the immune system and fight fatigue. Good THiNS, i've purchased many nabisco products in the past but have never tried these good thins flavored in sweet oat and flax. the taste is actually pretty good and slightly sweet, made with real oats, no artificial colors, flavors, or high fructose corn syrup. Chips Ahoy! THINS cinnamon sugar: this was a whole new experience with a chips ahoy, a thin crispy cookie that pairs wonderfully with hot beverages and has a nice crisp crunch. i received the cinnamon sugar flavor and am interested in trying their original flavor in the thins lines. Smucker's Fruit & Honey Fruit Spread, made with fruit and naturally sweetened with honey, the flavor i received in my box this month was a strawberry jalapeño and it was quite a surprise. not spicy in all relative ways but the spread did have a little heat note on the back end, something i really enjoyed! i'm pretty excited that i was able to try this via my monthly box. Kala Beans, roasted fava beans seasoned with himalayan pink salt and black pepper. i was pretty excited when i had seen these in this months degustabox, i tried roasted fava beans when i was in thailand last fall, the flavor and texture were something new to me at the time but the results were very tasty and a great drinking snack. so pardon me while i pour these out to enjoy with my craft beer. Loacker Gran Patisserie, these are totally new to me and delightful and very tasty. each rectangle of chocolate surrounds a crispy filled wafer with additional filling. my favorites of the locker gran patisserie were the noir chocolate, which was a dark chocolate with an orange filling. check back tomorrow to see what ingredient i used in a recipe from this month's degustabox!